HIGH C'S AHEAD! 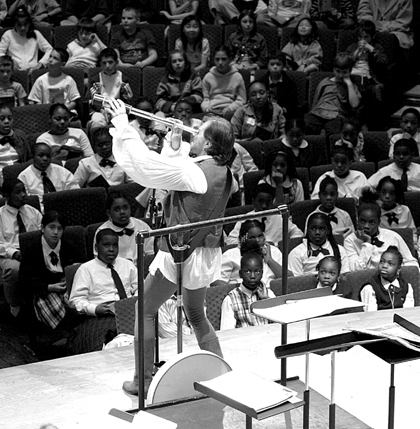 : Conductor Mark Laycock lived up to the spirit of the Princeton Symphony Orchestra's Bravo Kids concert, "Saliing the High C's," by performing as a pirate. All of the selections at last Monday's Richardson Auditorium concert were related to the sea. The program ended with a rousing rendition of Sousa's "Hands Across the Sea," after which the conductor went into the audience to shake hands with as many kids as he could reach. Princeton Borough Council voted for a spending increase in its 2005 budget last week to reflect costs required by municipalities under New Jersey's recently mobilized storm water regulations. The Regional Planning Board of Princeton has updated its recommendation that Princeton Borough create a law limiting the size of homes on single lots. The Princeton Township Bureau of Fire Prevention is asking for an increased inspection program and the hiring of two part-time inspectors, citing safety concerns and increased compliance with Township fire codes. For information on how to advertise, call the office at (609) 924-2200.